Saparote is ideally located for all the parties lovers. It is very closed to all the main parties in Koh Phangan such as Half Moon, Black Moon, Jungle Experience and Waterfall parties. 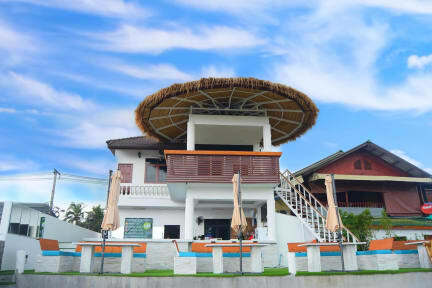 You can play tenis and enjoy a good massage to relax, drink a cocktail with a nice sea view on the bar inside the pool. We are few meters away from Bantai Beach. Also we are very close to the sport complex Phangan Arena. If you like sport and parties then you are at the right location. Quiet and pretty luxury hostel. I love the brand new office. They have a tennis court and a small swimming pool. Saparote is great value for money considering it offers pretty much the same or at least similar that the most expensive hostels in the island. I won't lie, and yeah there're few things need to be improven, however, I had a pleasent stay and this 2 French guys working there at the moment are super friendly and helpful. If you traveling in budget.. I think this is the best choice in Koh Phangan. Thanks!